The six-legged “Tiny Hero” of this gentle fantasy takes on a challenge far bigger than his size. The Tiny Hero of Ferny Creek Library by Linda Bailey, pictures by Victoria Jamieson. Greenwillow, 2017, 321 pages. 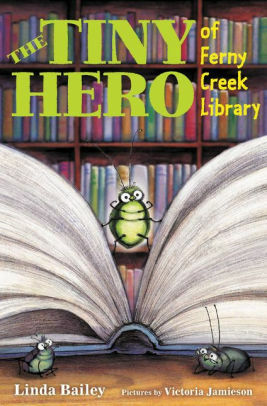 The Tiny Hero of the title has the distinction of being one of the few bugs in history who can read. It was a result of circumstance: Eddie’s family happens to live in the fourth-grade classroom of Ferny Creek Elementary, where they settled after escaping from a science project. His Aunt Min discovered the library, where she learned to read (and then taught Eddie, because he was the only one of his numerous family who wanted to). But now Aunt Min is missing and Eddie is delegated to bring her back home The journey to the library would be epic enough, but once he’s there he finds himself caught up in a vastly more important adventure, with the fate of their beloved library at stake.